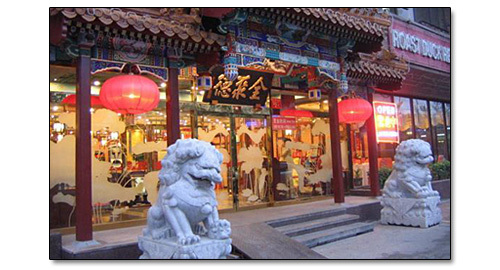 Quan Ju De is a well known local restaurant chain that specializes in Peking duck. We went to Quan Ju De Restaurant on November 24, 2010, Houhai location, for Gracie's birthday. The bus driver dropped us off at Lotus Lane (He Hua Shi Chang) in Houhai. Walk north along the west side of the lake (the lake should be on your right). The very nice guard/ soldier nearby ordered one of his men to accompany us there. We passed by many other bars and restaurants. Quanjude restaurant is near the end of the row, on your left. We were delighted when we learned that this particular branch of Quan Ju De throws in a complimentary cultural performance every evening at about 7 p.m. Arrive early to secure a table near the stage. You can check out the surrounding Houhai lake area (plenty of bars and restaurants) before or after dinner too. Cool resto. Peking duck is great because of its unique taste. So juicy and tender. But most chinese have techniques in roasting their ducks. The taste depends on the wood that was used in fire for roasting. Cool ayt? Cha, this is weird. The last time I did before ako magnap is magcomment dito sa post mong ito. And you know what, the whole time I was sleeping, pinapanaginipan kita na nagtravel ka raw sa place namin and I am your host. Hahaha. Weird. Share ko lang sayo! Hahaha. Ang haba naman ng pangalan. Peking Duck is something special for the Chinese and I don't know why. wow nice place to dine in CHINA. authentic Peking duck, was there any difference in taste with the ones served at Chinese Resto here, just curious lol..
Noks ha ha ha! Nakakatuwa naman yun panaginip mo! Sana nga pag napasyal ako sa lugar ninyo i tour mo ako!Salamat! Anjieya, yes the yummy peking duck sliced and can be wrap! I love Peking duck! :D I haven't had some in quite a while though. Anyway, I'll be checking this place out when I visit China in the future.